The wind is moaning around the house and the rain is pounding down while the ocean roars. The spring storms have arrived. The weather is definitely not suitable for plein air painting. We are currently having back to back storms with maybe a couple hours in between when the rain is merely pouring instead of torrential. Tomorrow the wind gusts on the beach are expected to hit between 50 and 60 mph. The rain will be pelting sideways. Too dangerous to paint. We had warning that these storms were approaching so I took the opportunity to get stocked up and catch up on outdoor chores before it hit. I have been working on a large (36"x24") painting in the studio while the storm shakes the house. I am not quite ready to share pictures of it yet. All this time indoors has given me a chance to think and reflect on where I am going with my art. It seems like the thinking and reflecting are an ongoing process. Perhaps it is because I am in the early stages of my art career, or perhaps it will always be this way. When I started out, I thought I would be painting portraits of women over 50 and telling their stories. I still love this concept and plan to do that one day. I had no idea when I took up plein air painting that I would fall so completely in love with it. Looking back now I have to wonder why it didn't occur to me sooner. I love the outdoors and love being outdoors, even when the weather is stormy. Combining that love with my love of painting seems such a no-brainer now! I am going to make a few changes in the way I am approaching marketing my art. I have been posting my small studio paintings on DailyPaintworks and I also have them listed on my website. I have been working at the online marketing aspect and even volunteer to man a co-op style (but not a true co-op) gallery in Cannon Beach. I have decided to discontinue DailyPaintworks and keep the paintings for sale on my website. I have also decided after much thought and consideration to no longer volunteer at the gallery. Volunteers get to have a small wall in the gallery to display some of their work for a month. I was given the month of December of this year. I will be giving that up for several reasons which I won't bore you all with here. All this is challenging and a bit nerve-wracking. It takes thinking in the long-term. I just have to take a deep breath and have courage...and faith. Here is what I plan to do instead: paint my rear end off. After much consideration I realized I just need to hunker down and paint. After I get a good solid footing and base, then I will integrate all the marketing, plein air events, and contests. I sat down with my mate to try to express the confusion I was feeling. The confusion was starting to interfere with my painting. My gut feeling was saying that I needed to let go of a few things and just paint and not worry about trying to sell much at this point. My wonderful mate said the exact same thing before I told him what I was thinking the solution might be. So, that is exactly what I am going to do. I will still put small paintings up for sale both here on the blog and on my website. I might enter a competition or two if it works out but I will not be painting with that in mind. The selling will come, maybe sooner than I realize. I just feel I need to sell from a sense of abundance rather than scarcity. My thoughts on the purpose of this blog was not only to share my work and the progress but to share the joys and challenges of becoming an artist too. Hopefully I don't whinge too much! The other day I got the "this must be so relaxing for you" statement. I stared at the woman making the comment for a minute and choked back a hysterical laugh. Relaxing? Not even. Every painting attempt takes intense focus, determination and the willingness to fail. Like all worthwhile endeavors, it is hard work. I wouldn't have it any other way. Well, this post has gone on long enough. 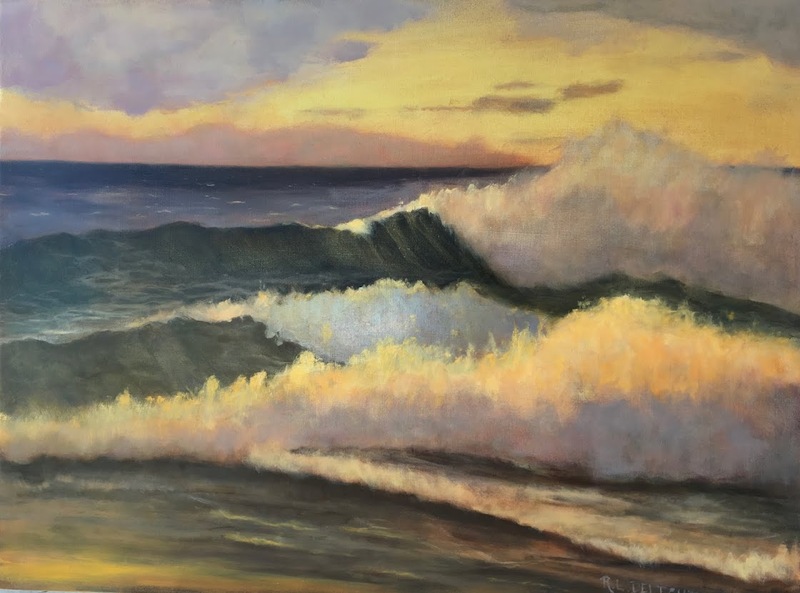 I will be getting out to paint waves as soon as I can stand in one place without being blown over by the wind. They are so lovely and wild at the moment. I do get out with my dog Twill. several times a day. We go to see what the waves are doing first thing in the morning no matter what the weather. The studio is busy and cozy now but I thought I would check in to let everyone know that I am still here and still working! 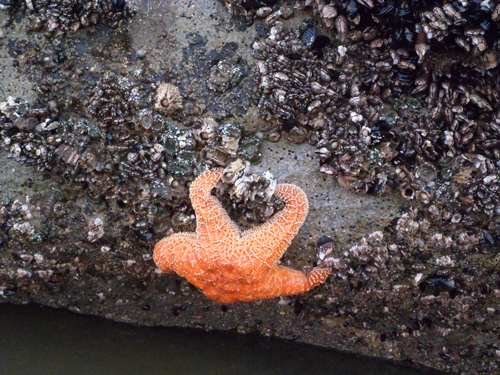 Sea star at low tide. 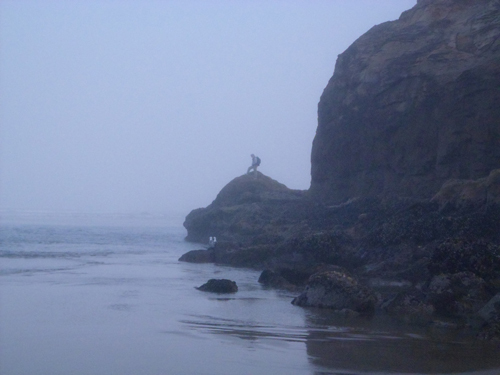 Hug Point ,OR.